Note:	Items shown in	boldface	are believed to be available for purchase at the time this bibliography was last revised. No attempt has been made to include entries from encyclopedias or similar reference works, or home-made or student videos such as those on YouTube. This video begins and ends as a travel documentary, but focuses on three stories of Alaska, including a fulfilling treatment of John Muir's "Stickeen" -- Muir's adventure on an Alaska glacier with a canine friend. A Portrait of John Muir as a Young Man by the Sierra Club's 2010 Outdoors Youth Ambassador, Evan Geary. Streaming Video: YOUTUBE. As part of the Sierra Club's Best Internship on Earth program, Evan created this entertaining video featuring John Muir historian Bonnie Gisel. Dr. Gisel gives a straightforward narration, while Evan and his animations "ham it up." "The Boyhood of John Muir" is a dramatic and compelling look at the early life of America's first great spokesman for wilderness. The film is divided into three parts. In the first part, the dramatic battle lines are drawn: the free-spirited boy John Muir is pitted against his well-intentioned but unforgiving father, and the joy of nature is John's escape from the pious solemnity of their rugged life on a Wisconsin farm in the 1850s. In the second part, John gets help in his struggle from both his mother and from an older neighbor called the Yankee -- help that helps him live with his father and learn the beautiful and just laws of the natural world. In the third part, John begins to make inventions, a skill that carries him away from the backbreaking labor of the farm; but a trick of fate shows him what he really cares about. At last he abandons mechanical science to pursue his overwhelming love of nature and God's creatures. Documentary on the life of John Muir, concentrating on his conservation efforts which led to the creation of the National Park at Yosemite. For general audiences. Same title as Stetson's audiocassette, this is a video recording of Stetson's one-man stage play of John Muir's story-telling while waiting word from Washington concerning the fate of Hetch Hetchy Valley. Epcot - The American Adventure-- "Teddy Roosevelt and John Muir"
YouTube video of Epcot - The American Adventure - Teddy Roosevelt and John Muir -video by Mark Brieve showing an excerpt from the show as presented on April 5, 2016. This is a brief excerpt of the Audio-Animatronics stage show of American history, portraying the famous meeting of John Muir with President Theodore Roosevelt in Yosemite. "Giants in the Wilderness," a 60-minute drama, set on a bluff overlooking Pike’s Peak, Colorado, October, 1896. One-act play and film portrays John Muir, Charles Sprague Sargent, and John Muir on a tour of the Western forests with the intent of writing a National Forest Report to be presented before Congress. Sargent and Pinchot lock horns about what the report should say, while Muir acts as a spiritual and philosophical buffer, providing insight into the sacredness of the wilderness at stake. Filmed at at Mount Wachusett Community College in Gardner, Massachusetts., July 21, 2000. © 1998. Script/rights for performance available from Genevieve Fraser, 211 Dana Road, Massachusetts 01364 U. S. A., telephone (home) 978-544-1872. "Heimgang" A film by Scott W. Harden. (310) 824-587. E-mail: sharden@ucla.edu VIDEOCASSETTE. A UCLA film student presentation, a "short" showing Muir, frustrated at his desk writing articles about the wilderness, leaping up and taking the train to Yosemite to re-experience the wilderness. Narration is solely from Muir's writings. Filmed on location at John Muir National Historic Site, Martinez, California, and Yosemite National Park. "In the Spirit of John Muir" by Zeki Basan. Filmed and Directed by Zeki Basan. Edited by Zeki Basan and Kirk F Watson. Music by Rob Webster. Streaming Video: Vimeo. 10:13. A 15 year old Scottish student travels the back country of Yosemite National Park to experience first-hand what John Muir experienced a hundred years ago Zeki lives in the Scottish highlands where Zeki he leads groups of adults in wilderness and ancestral living skills - tracking, foraging, tanning, shelter building, natural fire-making etc. He is planning a trip to Alaska to continue the 'spirit' of John Muir theme. He is also working with a group of Bushmen in Namibia to learn their skills with a view to preserving them. In the Spirit of John Muir: Zeki Basan from Zeki Basan on Vimeo. "John Muir: An Animated Life," by pupils at Law, Messelburgh burgh, and Dunbar Primary Schools in East Lothian, Scotland. A short animated film exploring the life of John Muir. Available to view on vimeo.com. John Muir - Coming Home - short film directed by Michael Coleman, 2016, Streaming video on Vimeo.com. 4:30 minutes. Director: Michael Coleman. Music by Dylan Roop and Steven de la Roche. Narrated by Nolan Mecham. A brief series of John Muir quotes, set against a visual background of several places authentic to Muir's life including his home in Martinez, California, northeast of Oakland and Muir Woods National Monument just north of San Francisco, California. Muir's original writings and books shown in the film were shot at his home including the windmill that accompanies the 2,600-acre fruit orchard that surrounded his families property and John Muir's desk in the "Scribble Den". Sources for each quote used in the film available on its vimeo.com page. John Muir - Coming Home from Michael Coleman on Vimeo. "John Muir: Environmentalist (1838-1914)" (Part of "Portraits: The Americans" Series) VIDEOCASSETTE. A GPN Production (Great Plains National Instructional Television), 1997. Product Code: 706.009. For grades 4 - 8; 15 minutes; color; Price: $39.95. This educational video, intended primarily for grade 4-8, tells Muir's life story in a conversational style presented by two engaging young people narrating, with an "expert" teacher occasionally appearing in the background. The video describes his immigration from Scotland to the deep woods of Wisconsin at the age of 11, his role as an inventor and amateur botanist, his educational pursuits, and his move to California where he spent much of his time in the Sierra Nevada Mountains and Yosemite Valley. The emphasis is on Muir's interest in forest protection. A major failing is that the Hetch Hetchy issue is not mentioned at all. The producers state that this video "encourages an appreciation of one man's accomplishments sparked by his view of the need to preserve the wilderness and facilitates the integration of history-social science, and science." SUPPORT MATERIALS: The teacher's guide includes a brief program synopsis, pre- and post-viewing activities, and cross-curriculum integration. CURRICULUM APPLICATIONS: The California Educational Technology Clearinghouse suggests these classroom activities to be used in conjunction with the film: Make a map that shows the places that John Muir explored. Explain how this exploration ultimately led to environmental legislation. Go on a nature walk. Try to observe the signs of flood, erosion, and pollution, as well as sounds (both natural and man-made). Compile observations upon returning. Debate the points of view between developers and environmental groups. Compare John Muir's lifestyle as he was growing up with that of the typical teenager of today. Read and discuss poetry based on nature. Write and illustrate short nature poems. John Muir Goes Camping with Theodore Roosevelt - In an episode on Comedy Central's "Drunk History" show, from Season 6, Episode 2.Actor Steve Berg narrates, while inebriated (or pretending to be), a very silly version of John Muir's camping trip with Theodore Roosevelt, Actor and comedian Thomas Middleditch played the role of John Muir. Host Derek Waters. Originally aired .January 23, 2019. Preservationist, naturalist, author, explorer, activist, scientist, farmer, John Muir (4/21/1838 - 12/24/1914) was all these things and more. Nearly a century after his death, this Scottish American is remembered and revered as the father of the environmental movement and the founder of the Sierra Club, the oldest and largest grassroots environmental organization in the United States. the PBS series American Masters premieres John Muir in the New World, on air nationally Monday, April 18 at 9 p.m. (check local listings) Explaining his impact then and now, this 90-minute documentary delves into Muir's life and influences with reenactments filmed in high definition throughout the majestic landscapes he visited: Wisconsin, Yosemite and the Sierra Nevada, the Alhambra Valley of California, and the glaciers of Alaska. Placing our nation's most important natural assets in a cultural and social context, John Muir in the New World is a timely reminder of America's unique and, ultimately, threatened ecosystems. Producer's press release (July 18, 2007). A film clip sample of this film is now available on the Global Village Media website. John Muir: from BBC One series "The Last Explorers." Episode 3 of 4. One Hour. First Broadcast: 08 Dec. 2011. In this series, Neil Oliver follows in the footsteps of four Scottish explorers who planted ideas rather than flags - ideas that shaped the modern world we know today. This episode, set in the spectacular Yosemite Valley in California, is the story of the father of the modern conservation movement and one of the founders of America's National Park movement. John Muir was a 19th-century adventurer who explored the natural world and devoted his life and work to persuade others to see the sacred beauty of his discoveries. Website: BBC One: The Last Explorers, John Muir (off-site link) - includes summary and 3 online video clips from the program (may not be available outside of Scotland). "John Muir: The Man, The Poet, The Legacy" VIDEOCASSETTE. A KRON-TV S.F. Production in Association with Chronicle Productions, 1981. Produced by Ziggy Stone. Available from Canyonlands Publications, 4860 N Ken Morey Dr.,	Bellemont, AZ (928) 779-3888. Color with b&w sequences, VHS and PAL format. An enthusiastic and comprehensive historical recounting of Muir's entire life by Thayer Walker which traces the events of Muir's life from his boyhood in Scotland and youth in Wisconsin, to his years of exploration and his career as a conservation crusader. Visits many of the places Muir lived and explored, with visual re-enactments, performed with heart-felt appreciation and respect for John Muir. For general audiences, excellent for classroom use. "John Muir: The Scot who fathered America's National Parks," by The Scotsman Newspaper, published 16 February 2017. A two-minute synopsis of John Muir's life from a Scottish perspective. "Earth-Planet Universe: John Muir". MOTION PICTURE. Same as above in 16 mm film format. One 16 mm. reel, 29 min.. (Said to be no longer available for purchase, but it may be available for rental from Indiana University, Audio-Visual Center, Bloomington, Indiana 47405; Toll Free Telephone ordering: (800) 552-8620 outside Indiana. Rental Price: $15.90 for up to five days; Purchase Price: $360. Order catalog No. NC1450,16. "John Muir" FILMSTRIP. Great American Film Factory, 1975. (52 frames, color, 35 mm. with audio cassette, 15 min.). Depicts the life of conservationist John Muir, emphasizing his campaign for the preservation of Yosemite National Park and wilderness areas. This program tells us the story of his life in his own words and those of others. For grade levels 5 - 7. Rental Price: $10.00 plus shipping (around $3.00) for a two-week booking; Purchase Price: $34.95. Available for purchase from Educational Images, Ltd., 306 Academy Pl., P.O. Box 3456, West Side Station, Elmire, N.Y. 14905. "John Muir's High Sierras" VIDEOCASSETTE. Dewitt Jones Productions, Los Angeles: Churchill Films (distributor) (1973). 1/2 in., VHS Videocassette. (27 minutes; School Version: 21 1/2 min..; color with b&w sequences). Film-maker Dewitt Jones worked in Yosemite National Park for 18 months to gather footage for this film. Jones retraced some of the hikes of naturalist-conservationist John Muir in the 'temples of nature' during the late 19th century. Excerpts from Muir's diary are read over these majestic images. The video presents the land Muir cherished and wanted to share, and the role he played in conserving the National Parks, founding the Sierra Club, and more. Rental Price: $60.00. Purchase Price: $310; School Version: $290.00. For ordering, see next listing. "John Muir's High Sierras" MOTION PICTURE. Same as above, in 16 mm. film format. Rental Price: $60.00; Purchase Price: $445; School Version: $415.00. Rental available from: Audience Planners, 5107 Douglas Fir Rd., Calabasas, CA 91302. Toll Free: (800) 624-8613; in California (818) 884-3100. Available for purchase from Churchill Films, 662 North Robertson Blvd., Los Angeles, CA 90069. John Muir Conference Lectures, 1990, University of the Pacific. 3 vols. VIDEOCASSETTE. $19.95 each ppd, or $55 for all three volumes. John Muir Center for Regional Studies, UOP, Stockton, CA 95211. (1) Paul Sheats, Edmund Schofield, Elizabeth Pomeroy; (2) Richard Fleck, Don Weiss, Keith Kennedy; (3) Stephen Mark, James Heffermen, Frederick Turner, Nancy Slack, Neil Fahy. See John Muir Newsletter v.3 no.3 (Summer, 1993) for details, or compare 1990 conference proceedings in John Muir Life and Work ed. by Sally Miller, above. "John Muir". MOTION PICTURE - UNAVAILABLE. Corsair Films: Released by Walt Disney Educational Materials Co., 1973). 15 min., color, 16 mm. With teacher's guide. Traces the events in John Muir's life which led to his successful efforts to secure environmental protection legislation. Lib. of Congress Cat. Call No. QH31.M9. "The John Muir Trail: A Video Trail Guide"
(Purple Dragon Ventures; produced by Joe and Carol McVeigh; with special appearance by Lee Stetson as John Muir (90 min.., 1/2 in., VHS Videocassette, 1994). Narrator: Carol McVeigh. Presented in two parts; Part One is a video excursion of all 212 miles of the John Muir Trail from Yosemite Valley to the top of Mt. Whitney. Not a slick commercial film, the video gives one the experience of hikers who really know and love the Trail, sharing their intimate experiences and the beautiful scenery. Part Two traces the length of the trail on topographic maps; a bit hard to read in a video format even on a fairly large screen. The video concludes with information on trail heads, permits, re-supply points, guidebooks, side-trips, and addresses. (Earth Images; Filmed, edited, and written by Lee Turkelson. John Muir quotations spoken by Mike Wilson. John Muir portrayed by Al King. (75 min.., 1/2 in., VHS Videocassette, 1996). Narrator: Joe David. This video presents a magnificent journey along "America's most majestic mountain path," from Mt. Whitney to the Valley of Yosemite. Includes grandly scenic footage, and spontaneous interviews with hikers along the trail. An useful and interesting feature of the film is to show several places in both early and late summer, with major snow contrasts. John Muir, portrayed by Al King, is featured at the beginning and the end of this travelog, while Muir quotations are interspersed throughout the video. "John Muir's 1,000 Mile Walk and Other Adventures" Presented by Dr. Richard E. Shore. "Kings Canyon National Park: Gem of the Sierra." DVD. Available from Sequoia Natural History Association. This 16 minute high definition film shows three unique regions of Kings Canyon National Park - the Kings Canyon, the Grant Grove and the High Sierra. In addition to capturing the incredible range of flora, fauna and terrain in Kings Canyon, there is a brief appearance of John Muir, portrayed by Frank Helling. Shown in the Kings Canyon National Park Visitor Center in Grant Grove, the DVD version includes over 35 minutes of special features. The spirit and voice of John Muir is alive due to the artistry of actor Lee Stetson who has been portraying the famous naturalist in Yosemite and throughout the U.S. since 1983. This documentary not only covers Stetson's remarkable career, but shows how Muir's eloquent words, written a century ago, continue to inspire and influence our attitudes to nature today. In this film, you will be inspired by excerpts from Stetson's five stage plays, journey with Stetson as he traces Muir's roots in Scotland and Wisconsin farm fields, and be captivated by the majesty of Yosemite, seen through the spirit of John Muir. Join Stetson as he performs stage plays based on Muir each spring and summer season in the Yosemite Theater and frequently guides visitors on saunters throughout the Yosemite Valley. Stetson has also performed as Muir in countless other venues around the world. A noted actor and historian, Stetson was the voice of John Muir in The National Parks: America's Best Idea,the acclaimed PBS documentary series by Ken Burns. Says Ken Burns about Lee Stetson, "Our good fortune in this project was meeting Lee Stetson, who knows more about John Muir than anyone else on earth. Hal Holbrook has been able to bring Mark Twain alive for us and does so magnificently. Lee Stetson does the same thing for John Muir. "As we got to know him... he [John Muir] ascended to the pantheon of the highest individuals in our country; I'm talking about the level of Abraham Lincoln, and Martin Luther King, and Thomas Jefferson, and Elizabeth Cady Stanton, Jackie Robinson -- people who have had a transformational effect on who we are." " The video includes a half-hour bonus feature of Stetson performing Muir's most famous story: Stickeen. Join Stetson portraying John Muir in the Yosemite Theater as he recounts the famous adventure Muir had with a tiny toy dog in a fierce storm on an Alaskan glacier. Lee Stetson: The Voice of John Muir is available from Amazon.com. "Looking for John Muir" MOTION PICTURE. A film by Robert Perkins - writer, narrator, and star. Cameraman, Graham Johnston. Presented by England's Channel Four. Shown on PBS, June, 1996. The LA Times calls this a "Misguided Travelogue" - and they're right! The film maker here passed up an excellent opportunity to explore what Muir's 1,000 Mile Walk to the Gulf may look like today, but instead provides little more than scenes of driving a sidecar motorcycle down truck-infested highways; visiting motels and hotels; and finding almost nothing of Muir left in the South. Because Perkins travels with a dog, he cannot even visit the one place Muir visited which is now a National Park - Mammoth Caves National Park. The only bright spot in this dismal documentary is the visit to Bonaventure Cemetery, which appears to be as beautiful today as when Muir slept there in October of1867. This film is not usable for educational purposes due to its mostly irrelevant focus. For ordering information, see Robert Perkins website, with free downloadable Quicktime preview. "The Mountains Call My Name" VIDEOCASSETTE. American Folklore Theatre, October 2, 1989. Written by Frederic "Doc" Heide, Ph.D.
First performed in 1989 and later in 1996, 2012, and 2013, this is a musical theater presentation depicting Muir's troubled youth and nature-inspired adulthood. See description and reviews on The Mountains Call My Name Northern Sky Theater website. The title song from the musical, The Mountains Call My Name by Fred "Doc" Heide, is available on his album Lessons I Learned From The Moon. A 2012 production by the "Lake Superior Big Top Chataugua" in Washburn, WI performed the musical theater production "The Mountains Call My Name: A Musical Portrait of Environmentalist John Muir" on August 18, 2012. This version describes the show as follows: "Join the Blue Canvas Orchestra for their musical portrayal of John Muir, founder of the national park system and the Sierra Club. Mount Ashwabay and the towering pines around the tent prove an ideal setting for the stories of Muir, a Scottish-born Wisconsin resident for much of his early life. Written by American Folklore Theatre co-founder Frederick "Doc" Heide, the show has been adapted by our own Tom Mitchell who plays Muir, and our Musical Director Ed Willett who leads the BCO in a moving selection of songs that celebrate the glorious natural wonders Muir encountered and wrote about in his travels. That glory is illuminated on the big screen with photography and film curated by our Visuals Director Betty Ferris. This show will be a feast for all of your senses and promises to become a new favorite Big Top Chautauqua show." The song The Mountains Call my Name is also available on YouTube, performed by Steve Koehler and Jimmy Kaplan in 2013 in the Fishstock Music Series, at Camp David's concert barn in Fish Creek, Wisconsin. Watch how MacGillivray Freeman Films will take moviegoers back in time to watch the camping trip that led to the creation of the U.S. National Parks. MacGillivray Freeman IMAX Film (original working title was America Wild; now re-titled National Parks Adventure) will take moviegoers back in time to watch the camping trip that led to the rapid development of the National Parks. To bring this history to life, MacGillivray Freeman Films turned to actors Joe Wiegand and Lee Stetson. Wiegand is well known for his work as President Theodore Roosevelt, while Stetson has portrayed the character of John Muir in Yosemite National Park for more than 30 years, and was featured in the acclaimed Ken Burns series, The National Parks: America's Best Idea. Narrated by Academy AwardÂ® winner Robert Redford, "National Parks Adventure" takes audiences on the ultimate off-trail adventure into the nation's awe-inspiring great outdoors and untamed wilderness. Immersive IMAXÂ® 3D cinematography takes viewers soaring over red rock canyons, up craggy mountain peaks and into other-worldly realms found within America's most legendary outdoor playgrounds. Join world-class mountaineer Conrad Anker, adventure photographer Max Lowe and artist Rachel Pohl as they hike, climb and explore their way across America's majestic parks â€“ including Yellowstone, Glacier National Park, Yosemite, and Arches â€“ in an action-packed celebration that will inspire the adventurer in us all, and highlight how important it is that we protect these treasured landscapes. Scheduled for release in theaters around the world, on February 12, 2016 in select IMAXÂ®, IMAX 3DÂ® and other giant-screen theatres. "Muir: Man among Giants" by Stone Soup Studios Motion Picture Company LLC. "Muir" directed by Chandler Ellison (2015) - Directed and produced by Chandler Ellison, Voice Actor: Kelly Lancaster,	Effects Animator: Hallie Jenkins; Character animation: Emily Searman & Nicole La Croix, Animation Cleanup and Color: Sylvia Chambers, Halllie Jenkins Nicole LaCroix, Emily Spearman; Layout Artist: Chandler Ellison; 3D Camera: Hanna Rember; 3D Modeler Caitlin Byham, 3D Lighting: Amanda Dqueo, Motion Designers: Becka Riccio & Yukari Schrickel, Compositing: Chandler Ellison, Sound Design: Carson Rennekamp, Music Composed and Performed by Paul Hanrahan. 4 min. Produced at Savannah College of Art and Design - The University for Creative Careers. Copyright 2015 by Chandler Ellision. This beautiful animated short film begins with Muir writing in his "scribble den" about the wilderness and our national parks; soon the view bores into his words, then burns through the parchment, to brighten into a variety of natural landscapes from various wilderness areas and many recognizable scenes in national parks, as the narrator reads excerpts from Muir's book "Our National Parks." This project was Ellison's senior graduating film project for her Bachelor of Fine Arts from Savannah College of Art and Design. Ellison not only directed and produced but was also responsible for all the design work, layout painting and compositing. It has been featured in many film festivals over the last year. More information about this production of Muir, including snapshot images from the film's storyboard, is available on Ellison's website. Muir from Chandler Ellison on Vimeo. Timothy's first year film at Cal Arts School of Film /Video in the Experimental Animation program (BFA) - A short stop motion film exploring the writings and adventures of naturalist, author, and father of the National Parks, John Muir. An excellent selection of Muir quotations, voiced with an expressive Scottish accent, in less than three minutes sums up Muir's life. Film by Ian Timothy, Voice of John Muir: Brad Will, Music: Marianna Filipp, Puppet Costume: Lucia Tello. The film "Muir" by Ian Timothy is available on Vimeo.com. See also: Claymation Sensation: Artist Animates John Muir by Maren Hunsberger (Sierra, Green Life, May-June 2014) Interview of film-maker Ian Timothy. Muir from Ian Timothy on Vimeo. "My First Summer in the Sierra: Illustrated Edition," by John Muir & Scot Miller, Book Trailer YOUTUBE, 2010. This video - a 3-minute "video trailer" for the forthcoming book - was prepared by the book's photographer, and interweaves splendid video with samples of the final photographs used in the book. Musical piano accompaniment is "Ca' the Yowes" by Robert Burns, performed by Tom Bopp. Timed to coincide with the 100th anniversary of the book's original publication, "My First Summer in the Sierra" - to be published March 2011 -- is illustrated with Scot Miller's stunning photographs, showcasing the dramatic landscape of the High Sierra plus John Muir's illustrations from the original edition and several previously unpublished illustrations from his 1911 manuscript. This newly illustrated anniversary edition will be a major landmark in John Muir's continuing inspiration to our modern world. The book details Muir's first extended trip to the Sierra Nevada in what is now Yosemite National Park, a landscape that entranced him immediately and had a profound effect on his life. The towering waterfalls, natural rock formations, and abundant plant and animal life helped Muir develop his views of the natural world, views that would eventually lead him to push for the creation of the national parks. The brand-new photographs from Scot Miller are a fitting contribution from the photographer who previously brought Henry David Thoreau's "Walden" and "Cape Cod" to life. This book is being published in collaboration with Yosemite Conservancy and, for each copy sold, Scot Miller is making a donation to Yosemite Conservancy. 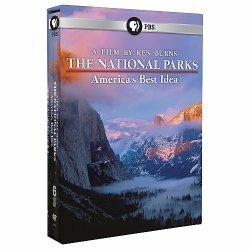 "The National Parks: America's Best Idea" a film by Ken Burns. DVD, Blu-Ray, or iTunes. Directed by Ken Burns and written and co-produced by Dayton Duncan. Narrated by Peter Coyote. Muir quotes (and interviews) performed by Lee Stetson. Produced by Florentine Films and WETA Washington, DC. Released by PBS television in September, 2009. This film emphasizes how all our national parks were protected by people like John Muir who cared and made a difference. The film shows how the national parks are essentially democratic, preserving glorious landscapes for all citizens, rich or poor. Extensive texts, photos, video clips, and interactive features are available on the PBS National Parks: America's Best Idea website. The PBS website also includes an extensive text, video, and photo biography of John Muir. Do not miss the 404-page companion book (also available as an audio book on CD or from iTunes). Made possible by a grant from the Corporation for Public Broadcasting; © Rocky Mountain Public Broadcasting Network, Inc. The emphasis is on quotations from Muir and nature photography as the life story of John Muir is told. Excellent, inspirational overview of Muir's wilderness exploration and conservation campaigns. The only failing in this video is that there is no mention of Hetch Hetchy. Out of print until recently, the video is now available from the John Muir National Historic Site Bookstore. Ode to Muir by Teton Gravity tells about a 40-mile foot-powered winter expedition deep into California's John Muir Wildernes by professional snowboarder, adventurer and founder of Protect Our Winters Jeremy Jones and two-time Olympian Elena Hight. August 22, 2018. Spirit of Yosemite - The Spectacular Visitor Orientation Film at Yosemite National Park. Produced by Greystone Communications/The Yosemite Fund; Directed by David Vassar. John Muir is played by Ben Goger. Available in VHS or DVD from Yosemite Association. 23 minutes; (2001). This state of the art orientation film for Yosemite interweaves the beauty of Yosemite with the historical influences that helped to create it. The film includes stunning vistas of Yosemite Valley, the giant sequoias, Tuolumne Meadows, and the High Sierra, often notable for amazing time-lapse photography. Historical vignettes include depictions of Galen Clark's discovery of the Mariposa Grove, and John Muir exploring Yosemite and drawing a map to show the boundaries of his proposed Yosemite National Park. The Special Edition DVD version includes over 30 minutes of additional material in the form of 3 new short films highlighting the beauty of Yosemite Valley, the Mariposa Grove of Big Trees, and Tuolumne Meadows and the High Sierra. The DVD also provides 8 audio options and 5 different languages: English, Spanish, French, German, and Japanese. Options for stereo surround without narration and a director and producer commentary track also are included. Kodak In Camera Article about this film. "The Story of Yosemite" DVD and VIDEOCASSETTE. (2000) Produced and Directed by Steve Parry, released by SunWest Media Group, Inc. This video contains three chapters: "The Poet and the Rough Rider," "John Muir's Yosemite," and "Falling Waters," all of which share much of the same film footage of Yosemite, shown in various seasons. The first Chapter includes narration of the meeting of President Theodore Roosevelt and John Muir, with dramatic sequences performed by Joe Early and Roosevelt and Lee Stetson as Muir. Unfortunately, this feature leaves out much of the dramatic re-enactment performed as a two-man play by Early and Stetson, and also fails to give any real details about their camping trip together. In an effort to enhance the drama, the producers misrepresent and exaggerate the differences between Roosevelt and Muir. The second chapter, "John Muir's Yosemite," features film footage accompanied by quotes and paraphrases from Muir's writings, with Rick Cimino as the voice of John Muir. The first section includes some of is more philosophical writings, while later sections feature his descriptions of waterfalls, forests, and other Yosemite features. A DVD feature includes a text John Muir profile. Unfortunately, the DVD menu for this section includes a photo of someone other than John Muir, whose only resemblance is the beard. The third chapter, "Falling Waters," features much of the same film footage, along with some additional footage, accompanied by piano music. "Sweet and Easy" by Kathy Muir - a music video of the song is on YouTube which includes images of John Muir in Yosemite, along with scenes of the Pacific Northwest depicted by Elizabeth Colborne's 1920's color woodcuts, and photographs (1924-1929) from the Seattle Camera Club, all "artists from a bygone era whose work continues to inspire and is included for the first time ever in a music video." "The Unruly Mystic: John Muir" (2018) - Documentary. 1 hour 10 minutes. This film focuses on the uniquely spiritual or mystical insights to be gained from of the remarkable life and writings of John Muir. John Muir was among the first to teach us that the gift of wild nature has unparalleled value for its spiritual nourishment, yet his message continues to be a primary inspiration today. Outstanding video photography of "nature's temples" are intertwined with perceptive interviews from people who are inspired by nature's beauty, and who were often inspired to encounter that beauty by John Muir. The filmmaker combines his own special sense of connectedness with nature - - something that goes beyond mere "outdoor recreation" -- with insights about Muir and the sacredness of nature from psychologists, authors, park rangers, and practitioners from varied spiritual traditions, as well as from everyday people. The film engagingly goes beyond just quoting Muir in the soundtrack (by a narrator with a Scottish accent), but provides the written words on screen to help the reader fully engage with Muir's message. As followers of Muir attest, today we recognize the necessity of not just passively enjoying nature, but for actively working to protect nature's treasures in order for everyone to experience them. This movie was created by filmmaker Michael M. Conti, Crazy Wisdom Films. The Asheville, North Carolina Premiere as held April 29, 2018 & May 24, 2018. The Colorado Premiere was held; 7 p.m. May 24, 2018, Dairy Arts Center, 2590 Walnut St., Boulder, Colorado. Available for rental or purchase (pre-order for release on September 1, 2018) on Vimeo.com). For more information: johnmuirmovie.com. 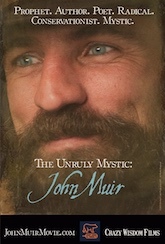 The Unruly Mystic: John Muir from Michael M. Conti on Vimeo. "Winter is Coming - Seven Days on the John Muir Trail" by Ryan Commons. ONLINE STREAMING VIDEO (2009). available on vimeo.com. A 40 minute video - slide-show of Ryan Common's 7 days solo backpacking the John Muir Trail from Whitney Portal to Yosemite in October. A rock-style musical sound track accompanies artistic photography, with periodic text panels quoting John Muir and explaining each part of the trip. Documentary focusing on the Hetch Hetchy battle, from historical and contemporary perspectives. Winner of the Best History award at the American Film Festival, and gold awards at the Chicago, San Francisco, and National Educational film festivals.. It was broadcast on The American Experience. Part of a series. For general audiences. This is a peaceful, relaxing, deliberately slow-moving video journey through Yosemite, including Tuolumne Meadows, the Giant Sequoias of the Mariposa Grove, and Yosemite Valley itself. It is an evocative film of Yosemite through the changing seasons. The sound track features Nature's sounds and New Age type music, with narration in John Muir's words by Lee Stetson. Many of Muir's best meditations on the beauties of nature are presented. The photography and Muir's words flow smoothly throughout this beautiful film. "Young John Muir Finding Old Home" - YouTube - A short film (6:20 min.). Presented by Dunbar Primary School, titled "A Most Unusual Boy". John Muir returns to his birthplace, Dunbar and meets a couple of local children. He tells them about his school and introduces them to his friends. A strange and beautiful twist to the story happens at the end. View on YouTube.